Give the gift of fun and health! Need a gift idea for friends or family members? THPRD gift cards are good for classes, passes, drop-in activities, tennis reservations or assessments. They are available in any denomination of $1 or more. Online orders take 3-5 days to process. Once you receive your new gift card by mail, you must activate it by phone. If you wish to use a gift card for class registration, please purchase at least 10 days prior to registration date. 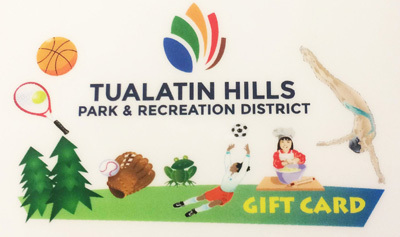 To buy and activate a card for immediate use, you may purchase it in person at any recreation or aquatic center or at the THPRD Administration office. Gift card balances of more than $5 are non-refundable. If you have a balance of less than $5, you may request your refund from THPRD or re-load your card (at a THPRD facility or online).